Here is how some of it goes with Mama (me), Mommy (my partner) and 11-year-old. Thursday night. Summer night. Hot, hot global-warming hot day. Worked late. Botched plan to go to pool and meet friends due to my late departure and then due to daughter’s cranky digging- in- her- heels- she-no-longer-wants-to-go attitude. I was sorry for being late, pissed off for the kink in our plans and determined to get us out of the sitting around languor of a summer night where we end up snarling at each other and picking what’s in the fridge rather than cooking. Then we’d end up watching some old DVD– bored with it and even with each other. It turned out it wasn’t necessary for me to insist. 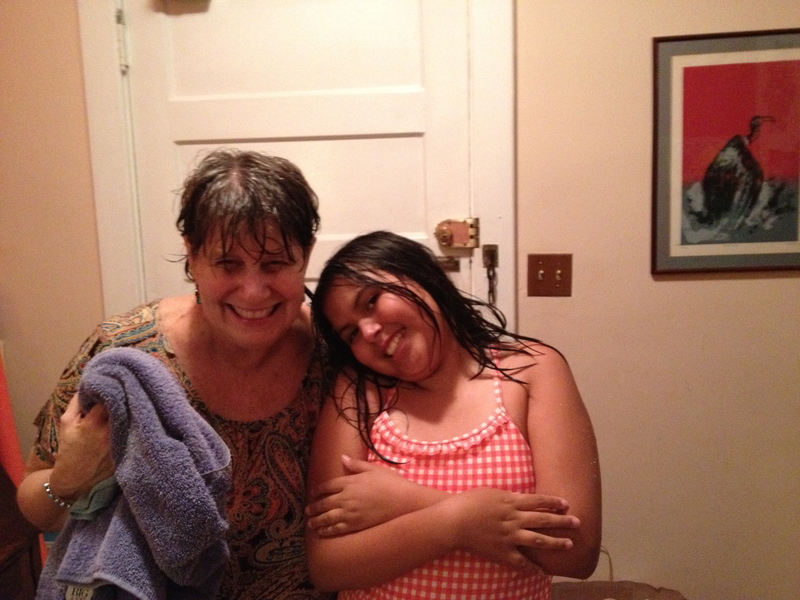 When I got home, at my daughter’s urging, I changed clothes in a hurry and we all went out. 3 of us. One scooter; no purse; one phone between us; a credit card and a $20 bill. We walked in the heat and she scootered– to a little business district one neighborhood over. With about every step, everyone’s mood picked up. We stopped at Dollar store–a dollar store I actually hate– though I really like some of them, but my daughter wanted to look. When we left daughter wanted to go home– two moms definitely wanted to eat out. Walked on to a pizza place we go to sometimes because of decent pizza and the fact that it is a close easy walk. Out of business. Achhh. On to a restaurant/ tavern on same strip that has been there 20 years, and I’ve never made it in. Food– good but not great. Decent and fresh Greek salad for me, mozzarella and tomato and basil salad for my partner. Good old-fashioned spaghetti with meat sauce (we never fix it with ground beef) for my daughter who seems to crave beef sometimes. The mood: better all the time and we laugh and joke and watch a baseball game on the TV over the bar at the restaurant, while my daughter joke-narrates the date of the couple across from us. Daughter and I leave my partner to finish eating and pay the check. We head for a little independent video store she and my partner know of and I’ve never heard of. Partner meets us, we browse their fabulous selection, find four films, take out a free membership and leave with our videos. Skies have been threatening all evening. We get half way home and the skies open up. No coats, no umbrella, no nothing. Just us and the torrential rain. As a baby, my daughter loved the rain. I loved and still love the sound of summer rain. Love thunder. Love lightning. We are blocks from home. My daughter is a different story. Hates thunder; hates lightning. It scares her. She avoids movie theaters in all their darkness and loudness. Going out or to school when there is a thunderstorm predicted is an issue. I have worked hard to get her to show herself– show her feelings about things and not stuff them away the way– out there– outside of my home, you are supposed to by 11 years old. 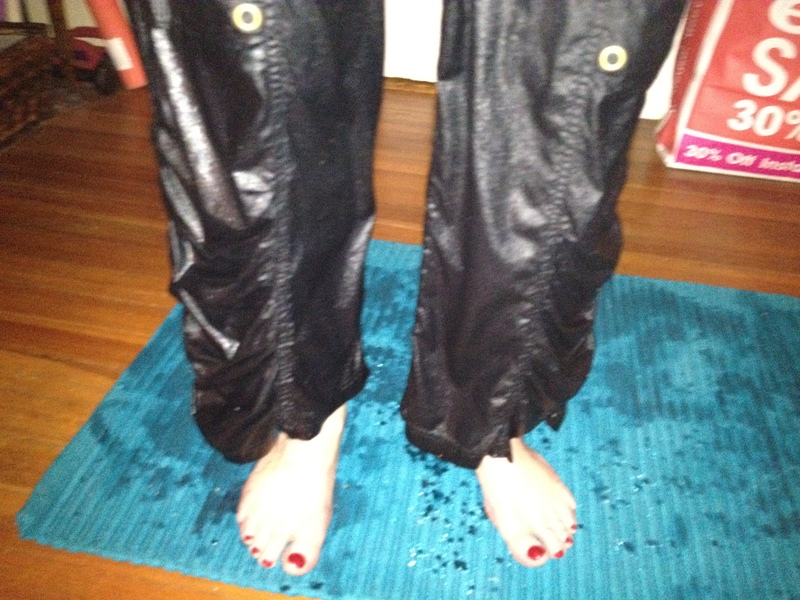 We walked and laughed for the first third of the walk home, wetter by the minute. In the second third of the walk the skies, the floodgate– opened for her. She began to cry and cried hard enough that even in the rainstorm I could see the huge tears running down her face. She cried and shuddered– “Mama, I’m scared” and then cried and cried– “I miss Jazzy, I miss Jazzy”. Jazzy, the neighbor’s dog, now dead– who hid and shook and hated thunder and lightning. And then like all summer storms, it ended. Hers ended before the rain did. The tears cleared– she had a fresh new perspective on rain and thunder– she took flying leaps into puddles and when we arrived on our porch– soaked through– she asked, could she stay outside, just a little longer? After the rain and before the towel, before the stripping off of wet clothes.